I can't speak on that because I don't know. I haven't been down there in years. A woman was holding a cardboard sign on Lower Wacker. She walked by my car while I was on my way home from Lincoln Park today. Also, I occasionally see a person walking down the north south part of Lower Wacker. The Blue Line portals at Lake are easier to access (besides the fact that you're trespassing) than the portals at UIC-Halsted, so they are fenced up for good reason. At UIC, one would either have to jump from an overpass (like Halsted Street, which has fences anyways) onto the trackbed, or play a game of Frogger with Eisenhower traffic and climb over the walls separating the highway with the CTA tracks before they could get to the portals. Not a good idea for legal and safety reasons. On a related note, one can do a search for Joseph Konopka, a person who was arrested while tresspassing in CTA tunnels among other things. The Blue Line portals at Lake are easier to access (besides the fact that you're trespassing) than the portals at UIC-Halsted. At UIC, one would either have to jump from an overpass (like Halsted Street, which has fences anyways) onto the trackbed, or play a game of Frogger with Eisenhower traffic and climb over the walls separating the highway with the CTA tracks before they could get to the portals. Or you can enter the UIC-Halsted station, walk east along the tracks to the portals. You just have to be quick and make sure no one sees you, watch out for trains and the third rail. The same thing with the lake portals, just walk west from Clark/Lake through the tunnel until you reach the portal. Again, you have to make sure no one sees you and watch out for trains. Again, you have to make sure no one sees you and watch out for trains. Almost impossible, if not impossible, with the nice new security cameras the CTA put in. Either way, I don't plan to try in my lifetime, and encourage other members not to participate in accessing these areas. One thing I missed that was earlier in this topic was the discussion about the station ramps on the Forest Park branch. It's good that the Western ramp is getting patched up, but I'm sure other ramps need similar work. I have walked down the Racine ramp and saw that it is quite chipped. I've also noticed that Illinois Medical District and Racine have additional lights on the platform that are mounted to the center of the platform canopy, in addition to the original lights mounted along the edges of the canopy. UIC-Halsted has these too, but they do not work at the moment. Finally, I am also linking to the July 9th CTA slow zone map for those who want to see how the Forest Park branch is doing. I don't think that the point of this forum is to train people how to get electrocuted or arrested for trespass. On the discussion about the ramps, I agree with garmon and Busjack that ADA compliance wasn't their initial intent, but modifying the turnstiles to include a gate for wheelchairs was the route they took to initially make Halsted and Kedzie-Homan ADA compliant without the use of elevators. It is easy to see though how the ramps can be tough to negotiate for some in wheelchairs who are exiting the station after they've disembarked from a train. The Forest Park station ramps inefficient design for the customer traffic of later years are probably why they didn't really go beyond Halsted, Kedzie-Homan, and I just remembered Illinois Medical District for Forest Park Blue Line ADA compliance and why CTA stations along the Dan Ryan and Kennedy don't have similar ramps but stairways and escalators for those who can walk freely, and elevators in the case of stations that are ADA accessible. Makes sense. However I was commenting about the state the ramps are in now. I might have missed whether the Western ramp is getting repaired, or being altered to have ADA access. Either way, it would be good to have repairs because less people would trip over bad areas or cracks. It's a sarcastic joke. If someone is dumb enough to do what I said, then it's on them. I made that observation about the patching up of the ramps at Western earlier in this thread. A shot of the UIC Halsted Peoria station house under construction. It's interesting how they set that up like they can add another platform with two more tracks. Now that would be cool. Are you getting that from the two boarded up areas? The layout isn't clear at this point, but, fortunately, chicago-l.org has a rendering of the Peoria plan. It still looks like 2 tracks, but the bulk of the glass station house is over one (north) track. BusHunter's picture indicates that they've "only just begun." The boarded up area to the right is apparently for the stairs or escalator. I see. I was looking at the left side of his photo where the ladder is at. It's interesting how the station house is still there, but the bridge that connected to it is completely gone except for its supports. I'm sure this all has to be coordinated with IDOT. As noted in the Alert, Morgan reopened and Peoria closed, I guess for obvious reasons. A couple new documents were recently posted on the project webpage. reflect a recommendation that extension of the Blue Line Forest Park Branch or proposed stations are feasible", so perhaps the extension will still be on the table. The second is the "Evaluation of Transit Markets Final Report", which primarily talks about the demographics and bus routes in station areas. ​The issues regarding a Mannheim extension is whether Pace will extend express buses from there, and if IDOT will do something about the fact that the Hillside Strangler project basically moved the bottleneck from Mannheim to 25th Ave. If the first but not the second are resolved, the rapid transit extension would make sense, but as the combination of 747 into 301 indicates, maybe local service to Forest Park (301) or 54/Pink Line (322) is sufficient. Reinstating 747 would be sufficient if the bottleneck is eventually removed between 25th and Des Plaines Ave.
- Reconstruction of Forest Park Station and Yard can be completed independently of the rest of the line. 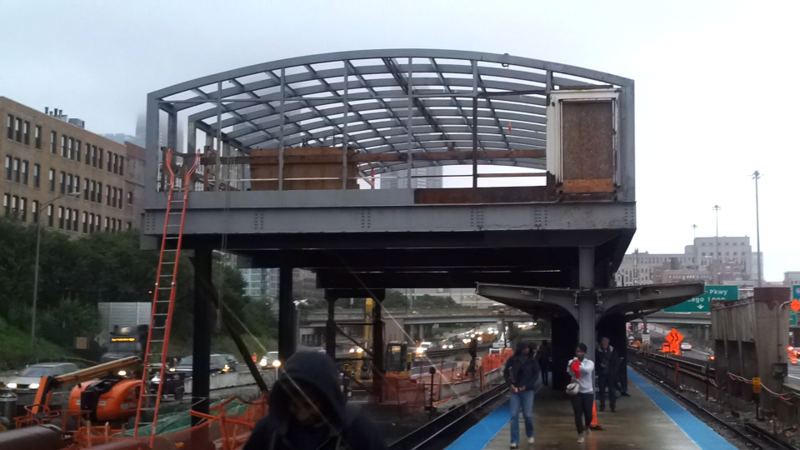 I took some shots of the Blue line's UIC halsted entrance; reopened not long ago. As you can see in the pictures, the elevator's not done yet. Then i took a ride on the Forest Pk branch, they have been working on these slow zones , I see. The train was just slow about California to Hamlin going west and there was a small segment at Central. The Peoria entrance sort of shows us a way they could rebuild the IMD/medical center stop. The line could probably attract more riders if it's stations didn't require a long inclined ramp to get to the stations. Since I was trekking in the UIC area today, (nice day for a walk) I took some pictures of UIC-Halsted Blue line as well as some construction pictures of the circle interchange/spaghetti bowl. Made a few observations also. The mezzanine looks better without all the wood!! A look at the Harrison bridge, it was a rolling/wavy bridge before and it is again!! Why does this remind me of the ramp the nazi's fell off of in the Blues Brothers? I trying to think what is the highest ramp in Chicago. It must be the skyway bridge (not really a ramp though), but there is a really tall ramp in Milwaukee near downtown going north from I-94 to the west by Miller Park. Why does this remind me of the ramp the nazi's fell off of in the Blues Brothers? That one was I-794 in Milwaukee. Supposedly the EIS for IDOT's 290 rebuild will be out soon. - Recommendation to open secondary entrances at Keeler (Pulaski Stn) and Lavergne (Cicero Stn). The diagram shows a headhouse that is closer to the main street (i.e. no ramp), and a long ramp up to the secondary entrances (maybe about 600-700 feet long). - The presentation also mentions an auxiliary entrance at all single entry stations including Western. Perhaps this will mean a relocation of the platform directly under the avenue? - $1.7 billion estimate, includes tracks, FP Yard, stations, and 6 substations. phasing and future service increase to IMD." Apparent intent is that UIC trains would be extended to IMD. While noted in the study area map in the CTA presentation, page 2, red dotted line, CTA doesn't acknowledge it. It says redoing the Forest Park terminal in the existing parcel. Another omission I could throw out there (based on the Pink Line being on the map and the Circle Line plan) is the lack of a Blue/Pink transfer station at IMD. Maybe the TIF project is too far along. From the look of the picture, it does look like a shifting of the platforms, but not necessarily under the avenue. 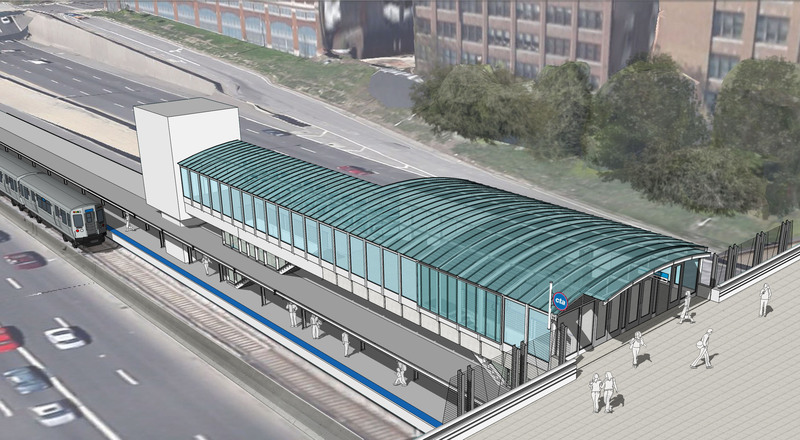 It looks more like they want to do for Pulaski, and Cicero is simply move the platforms just close enough so that the ramp of the main entrance gets replaced with an elevator and stairway/escalator similar to how the Dan Ryan stations are done along the Red Line. For Western maybe they want to put an auxiliary entrance across the street from the main entrance similar to what the 79th Red Line station set up is with the station platform shifted in a way to accommodate that and still get rid of the current main entrance ramp layout. That way they can replace the NB 49/X49 Van Buren bus stop with one that's directly in front of that auxiliary entrance.